The City of Victoria (80,032 inhabitants in 2011; 1,947 ha), located on the southern tip of Vancouver Island, is the capital of British Columbia. The City was founded by the Hudson's Bay Company on March 14, 1843, as a trading post and fort at the location the First Nations called "Camosack" meaning "Rush of Water." Anticipating that under the Oregon Treaty, then being drawn up, the 49th parallel would be chosen as the International Boundary Line, the Hudson's Bay Company moved its fort from Vancouver on the Columbia River to the southern end of Vancouver Island. Thereafter, for a short time, it was known locally as "Fort Albert," but by resolution passed by the Council of the Northern Department of the Company meeting at Fort Garry on June 10, 1843, it was officially named "Fort Victoria" after the great British Queen. With the Fraser Valley gold rush in 1858, Victoria grew rapidly as the main port of entry to the Colonies of Vancouver Island and British Columbia. When the colonies combined, the City became the colonial capital and was established as the provincial capital when British Columbia joined the Canadian Confederation in 1871. The flag of the City of Victoria has a light blue field with the city’s coat of arms in the centre, nearly the full height of the flag. The simple shield has a horizontal top and simply-curved sides forming a pointed “U” shape. On it appears a white “V” shape with narrow arms descending from the upper corners to a point nearly reaching the base. The field above it, forming an inverted triangle, is red and bears a royal crown in red, yellow, and white, with gems of various colours and filling most of the space. The field below the “V” is blue. Atop the shield is a knight’s helmet, in blue with black, white, and light blue details. Above that is a three-towered mural crown in golden yellow. Over the crown is a white dove in flight, descending with a green olive branch in its beak. Above the dove is a light blue equilateral triangle, edged in golden yellow, bearing an eye in blue and golden yellow, radiating from its base several rays of golden yellow which continue the angles of the triangle’s sides. Around the knight’s helmet is red and yellow mantling. On either side of the shield is an angel depicted naturalistically in robes of white with blue details and golden yellow wings. The angels stand on white clouds edged at their base by two wavy stripes, white over blue, and their inner hands each support a branch of green laurel. Below is a yellow scroll with a red back, outlined in black, inscribed SEMPER LIBER in serif letters, in red. The “V” stands for “Victoria”. The area beginning at the base of the “V” and going upward and outward suggests the growth of the city. The red inverted triangle above the “V” symbolizes the peninsula on which Victoria is located, while the blue area represents the sea into which the peninsula juts. The white stripe between the two suggests the surf of the coastline. The royal crown honours Queen Victoria, the city’s namesake, who was queen of both the United Kingdom and the Dominion of Canada at its founding in 1841. The angels represent the twin sisters “Colonization” and “Civilization”. The laurel branches are a tribute to those who have served the municipality. The “All-Seeing Eye” is the emblem of the Trinity and implies constant dependence on the blessing of life from the bounty of the deity. The dove and olive branch together signify hope and peace; the mural crown signifies municipal authority. The red and gold of the mantling, considered royal colours, refer to Queen Victoria. The wavy stripes of the cloud symbolize water and Victoria’s island location. The City’s Latin motto, Semper Liber or “Always Free” recalls the Free Port System in Victoria’s history and the freedom of its civil institutions. Unknown. The arms were granted by the English Kings of Arms in London, England, on 10 May 1962. The city flag is used for special council meetings and official protocol functions involving visiting dignitaries. While the council chamber has a Canadian flag and a Commonwealth flag on the dais in a fairly permanent position, the City of Victoria flag does not fly during regular council meetings. However, Victoria’s city hall flies the flag at its entrance. Outside, in Centennial Square, the British Columbia flag flies with the logo flag. The arms of Victoria were originally recorded in the records of the College of Arms, London, England, 10 May 1962. They were confirmed by Letters Patent issued on 20 My 2005 and registered in the Public Register of Arms, Flags and Badges, vol. IV, p. 492, as announced on 29 October 2005 in the Canada Gazette, vol. 139, p. 3450. The arms are explained on the municipal website as follows. The centre of the design is a blue shield with a wedge-shaped section of white placed upon it, the point of the wedge towards the base. Upon this white wedge or "pile" as it is termed in heraldry, is placed another one slightly smaller, in scarlet. The overall effect is a white V separating the two colour areas of blue and red, thus creating a cypher for the name Victoria. Starting from the point in base and radiating upward and outward this white V is also suggestive of the growth of the City. The scarlet wedge-shaped upper section may be said to represent the peninsula where the City of Victoria is located jutting out into the blue sea, the white V suggesting the surfy coast line. The "Tudor" Crown displayed on the scarlet area pays honour to and commemorates Queen Victoria the Good, after whom the City was named. The shield is flanked by emblematic Angel figures as on the City's Seal representing the twin sisters of Colonization on the left and Civilization on the right. Each supports with the inner hand a branch of laurel as a symbol of honour and form of tribute to those with municipal public service to their credit. The All-seeing Eye above is the emblem of the Trinity and suggestive of our constant dependence for the blessings of life upon the bounty of the Deity; the dove with the olive branch symbolizes hope and peace; and the gold Mural Crown is a symbol of municipal authority. These three together form the Crest. The mantling flowing from the top of the helmet indicates the municipal colours, Gold and Scarlet (the Royal Colours, another reference to Queen Victoria). The compartment upon which the shield and supporters rest is of Clouds as on the Seal, while the light blue and white wavy bands along the front edge of the Clouds represent Water and indicate Victoria's insular position. The City's motto, "Semper Liber" -- Always Free -- is borne on a scroll at the base of the composition and is suggestive of the Free Port system in Victoria's experience and civil institutions. On a field of white and in proportions of 1:2, the logo flag places the city’s light blue flag-like stylized-V logo in the centre, with THE CITY OF in small letters over VICTORIA in large letters, all sans-serif and black, below. Both flags are still in use in Victoria as of Sunday. From what I was able to see on the course of the Canada Day weekend, the heraldic flag was used more than the logo flag. I saw the heraldic flag at three locations; one at city hall, one at the Victoria Convention Centre and possibly one at a police-like building. The logo flag, on the other hand, I only found once. I found this logo flag at an information booth across the street from The Empress Hotel. As for the ratio, I think it was 1x2, just like the Canadian and BC flags that were next to it. I did not see this flag anywhere else yet this logo was used a lot in different city events or posters in my hostel. An 18 year-old chap named Callum McDonald is in the process of organizing an on-line competition to replace the current Victoria city flags – the coat of arms on a sky blue banner and the business card on a bed sheet with a proper flag. My information comes from two newspaper articles and an interview on the local CBC morning program. I have no idea whether or not he is a member of either or both NAVA and the FOTW group, but Callum appears to be aware of good flag design. For what it is worth, Mayor Lisa Helps is supportive. Callum’s website is http://aflagforvictoria.weebly.com should you wish to pursue the project. This standard is not used on a daily basis. I would compare it to the Colours of a military regiment. I personally have never seen it in use, so I cannot confirm when it would be carried. The flag that is flown at Police Headquarters in Caledonia Street on a usual basis is the dark blue flag bearing the departmental arms. 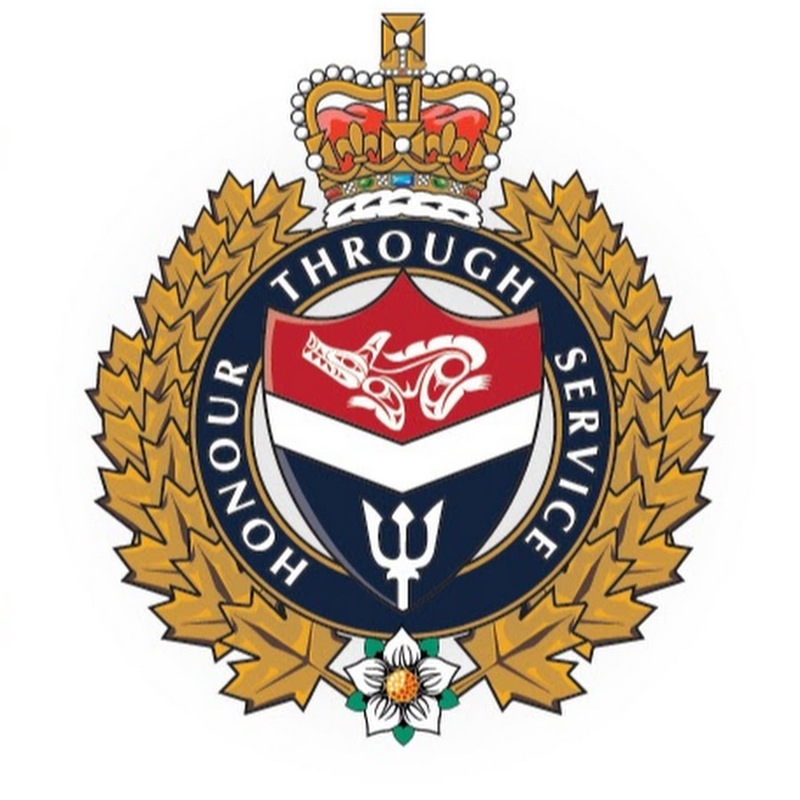 This second graphic of the other Victoria Police Department flag that Dave found showing the Department's coat of arms and name on a dark blue field. I wonder if one is for primarily ceremonial use while the other is to represent the Department in an everyday manner?